The Caesar Exhibition displays photographs of detainees from the Syrian regime’s prisons and detention centres. The photographs were taken by a former military policeman of the Syrian army – known by the pseudonym “Caesar” – who fled Syria in 2013. Caesar smuggled out with him over 55,000 photos of approximately7.000 Syrians tortured by the Assad regime. The 11.000 victims he photographed represent only a fraction of the systematic torture and killing that still take place inside Syrian regime’s prisons. During his service for the military police of the Assad regime, Caesar was a crime scene photographer. His duties were to photograph and document the bodies of those brought from their places of detention to military Hospitals 607 and 601 – the hospitals used by the Syrian regime as processing centres for tortured prisoners. 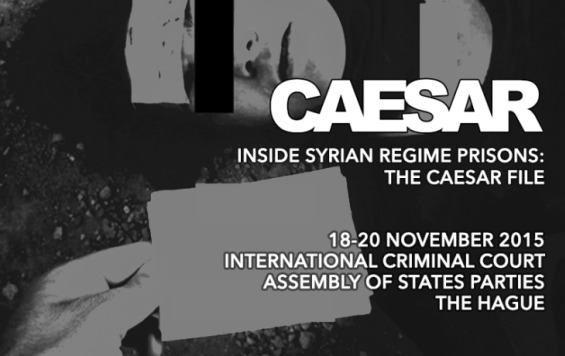 The individuals in the Caesar photographs were tortured and killed by agents of the Assad regime between March 2011 and August 2013. The photographs show evidence of physical injury of the sort that would result from starvation, brutal beating, strangulation and other forms of torture and killing. After thorough analysis by a first-rate legal and forensic team in early 2014, the “Caesar” photographs were shared with and processed by the United Nations Independent International Commission of Inquiry (COI), which cited them as clear evidence of systematic human rights violations by the Assad regime. The exhibition will open with a ceremony on Wednesday 18 November 2015 at 18h00, in the margins of the International Criminal Court Assembly of States Parties, in the Yangtze Room, 1st Floor, World Forum, The Hague, through to Friday 20 November 2015. For further information, please contact: Alison Smith (Director of International Criminal Justice Program) on asmith@npwj.org or +32-2-548 39 12 or Nicola Giovannini (Press & Public Affairs Coordinator) on ngiovannini@npwj.org or +32 2 548 39 15. No Peace Without Justice, which is a founding member of the NGO Coalition for the International Criminal Court (CICC) and which has been one of the organisations at the forefront of promoting the establishment and entry into force of the permanent International Criminal Court (ICC) and continues to work for its universal ratification, has participated in every session of the ASP since its first session in 2002, the year the ICC was established.